All Work at Home Jobs are Scams? This common work at home myth is one I see a lot of and one that gets under my skin the most. I have no idea how many times I have shaken my fist at my computer screen as I read those words from advice givers. I know that many of the people who have said “all work at home jobs are scams” are pure in heart with their statement. I too once believed this to be true. However, I am so glad I didn’t let that mindset stop me from digging deeper. I hope sites like WAHAdventures.com make the task of finding legitimate work at home jobs a lot easier for those beginning their search. 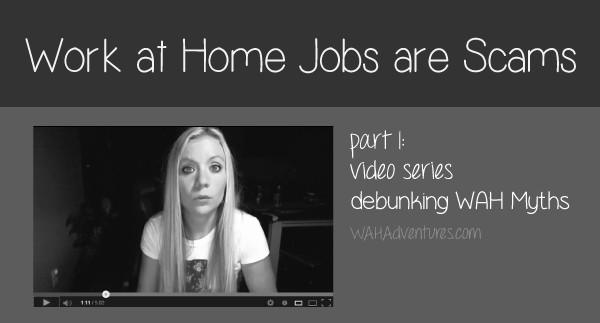 I hope you enjoy the first of 5 video series debunking the Myths of Working from Home. “You just found yourself an easy way to make quick money”. My mouth literally fell open. I looked at her, laughing, and said “I will let that one go. Have a nice day.” And walked out of her store. Proof to me that work at home are not scams! They have to pay for me to proof they are not lying & not a scam! How I know they are not lying! Thank you SOOOOO much for this website, I knew there were legitimate work at home jobs( hired by one last month). I received a couple of scam offer but with a little research and they were found out. I don;t know how you found these companies and job search engines can not. Work at home are scams! They have confidence me they telling me the truth! Only way is they pay for me to proof they are tell the truth and not a scam! Than I’m right! All work at home are scams!